The impact of mental health in the workplace is astounding. Consider that the cost of mental illnesses to the economy is $51 billion a year and that each week 500,000 Canadians will miss work due to a mental health issue. The fact that mental health and the workplace are so closely linked is the reason why the Ontario Chamber of Commerce (OCC) and Canadian Mental Health Association (CMHA), Ontario are joining forces to support each other’s advocacy campaigns in the lead up to the June 7th provincial election. The OCC and CMHA Ontario jointly call on political parties to commit to urgently-needed investments in mental health and addictions care in order to help build and support a healthy and resilient workforce. Building healthy communities is a key pillar of Vote Prosperity, the OCC’s 2018 election platform. 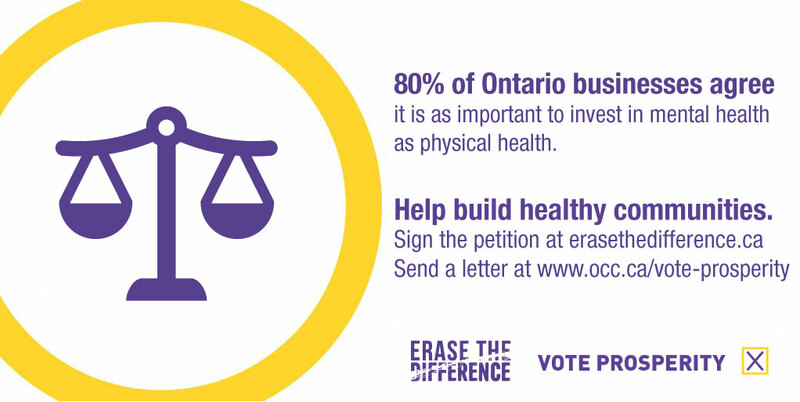 CMHA Ontario, meanwhile, is asking people to visit erasethedifference.ca, and sign a petition that calls on political parties to fund mental health and addictions care like physical health care. Join thousands of Ontarians in letting provincial candidates know that it’s time to #voteprosperity and #erasethedifference.